Some things in life are complex. Many games require careful consideration, a deeper understanding, and a keen eye for the bigger picture. Some things, however, are simple. 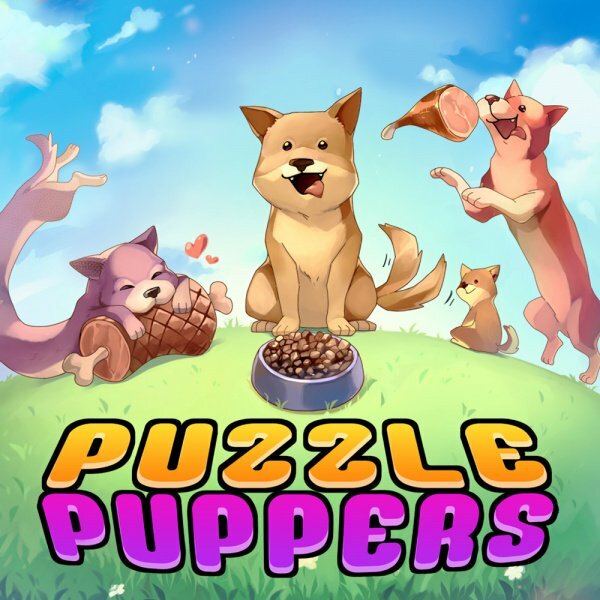 Puzzle Puppers is direct, uncomplicated, and pure; the perfect representation of the grinning, slobbering pooches who act as the stars of the show. 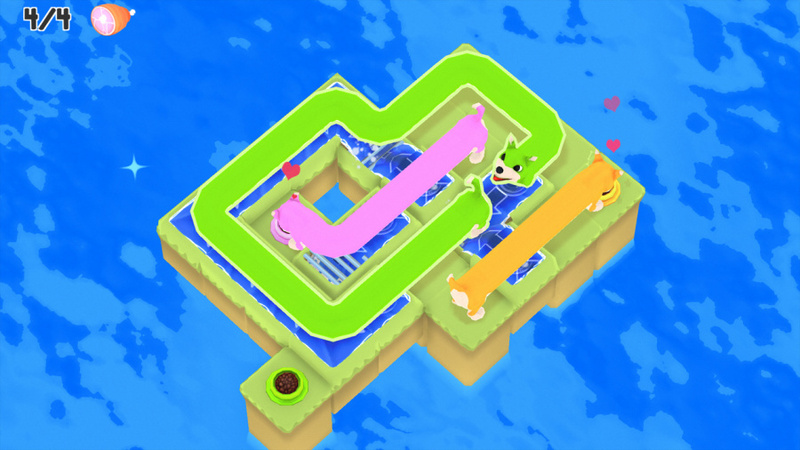 It's bright, cheerful, and doesn't pretend to be anything more than it is, which is a fun little puzzle title that asks the player to feed some adorable stretch-dogs, naturally. 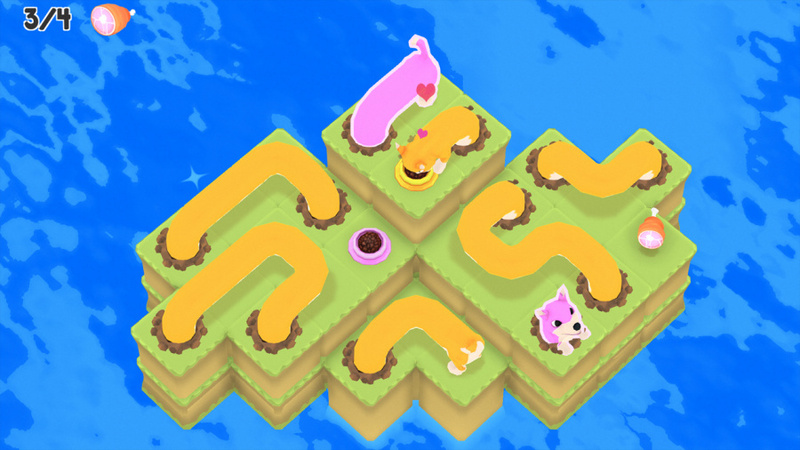 Set across a series of 80 levels with some small, cutesy islands to navigate, your main objective is to move each hungry hound to their colour-coded food bowls. You move across a grid, leaving your hind legs behind as your front half stretches to impossible lengths, winding around from one square to another. All you have to do is direct which way your good boy goes in order to avoid obstacles, controlling up to four doggos at a time. You can easily back away if you get stuck, so the challenge comes from managing the doggy spaghetti that results from stretching multiple pooches across one small piece of land. 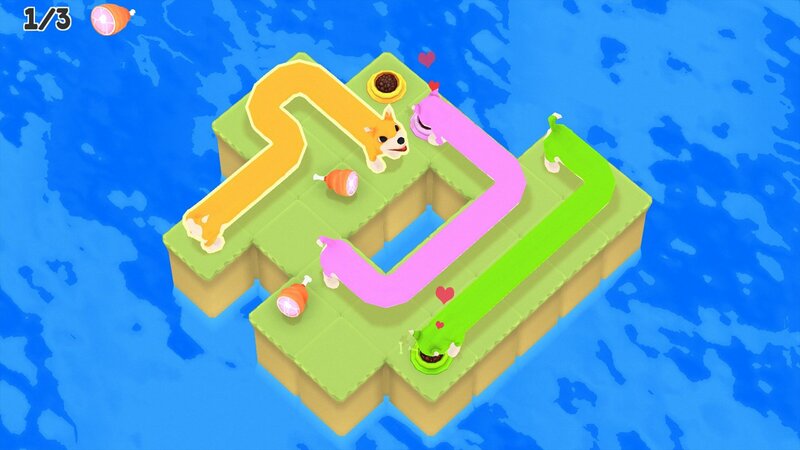 Levels are completed when each dog is happily eating from the bowl of their colour, but there are also bonus chunks of meat to collect if you'd like to push your skills a little further. Doing so will earn you the highest possible ranking for the level, and consistently earning top marks will unlock bonus stages. As you progress, a handful of mechanics are introduced such as multiple dog bowls to choose from, holes in the ground which pop you out at a different part of the level, and streams of water which basically act as moving conveyor belts. Stages can have multiple solutions, and your best-laid plans often go awry as doggy bodies block the way, and lead into frustrating dead ends. The visuals and music are instantly charming, and almost dream-like in their total detachment from anything serious or realistic. There's no explanation for why these dogs can stretch, but what's the point in worrying about that when they look so dang happy doing it? The vibrant colours are appealing to the eye and also make it extremely easy to distinguish one dog from another during gameplay. Our real complaint comes from the total lack of variety, with each level blurring into the next as a result of identical ocean landscapes, repetitious music, and no story mode or structure to speak of. It's all very pleasant, but it all sort of drifts into the background before long. Apart from those few extra mechanics, once you've played the first ten levels of Puzzle Puppers you've basically experienced the extent of what it has to offer. As we've said, there's a purity to its simplicity, but without some form of story mode to add context or a little more visual flair, it's the gameplay alone that's going to keep you engaged. Thankfully, it does work in this regard and while it certainly isn't too much of a challenge, it's perfect if you aren't looking for anything substantial. It looks fine on the big screen, but that's where the lack of content starts to show a little more. If you need something quick to play on the go in portable mode, then this is a much easier recommendation. Puzzle Puppers is a very simple game about some very cute dogs. Its bright colours and bizarre premise are endearing, the gameplay is easy to grasp, and you'll be in hound heaven for the first 20 stages or so. After a while however, this old dog shows that it hasn't learned any new tricks, and the repetitive visuals don't do anything to elevate the equally repetitive gameplay. It's good clean fun, straightforward to an absolute fault, and for the low asking price there's enough here to make this worthwhile. If you're expecting a magical doggy story mode, or some imaginative level design however, you'll be left feeling a little ruff. I like puzzle games but this one really doesn't appeal to me. As soon as I saw the pictures I knew it would be a port of an iOS/Android game. Think I'll pass as there's much better on offer. I saw this one the other day. For $5 sounds ok.
For 5 bucks, it seems like a nice little chill game. The kind of game you can play for a bit and toss aside guilt free when you get bored because it cost less than a little Ceasars pizza and barely more than a single pack of Pokemon cards. Lol at people saying it is free on mobile devices. Why would I want to play a game on a phone? If it is free there, that means it is gonna be full of ads and probably has a daily time limit or some other such nonsense. Doggone it, was hoping fur a little more from this. This is the kind of game I would make! So it's also the kind of game I'd like to play.